The Wellbeing Spa at the London Wellbeing Festival (25 - 28 May) is hosted by Soul Stretch Events and provides a tranquil, sumptuous haven, where festival goers can escape to for a rejuvenating holistic treatment. Eleven different types of therapies will be provided by a team of passionate, skilled therapists using natural, organic products in beautifully decorated healing spaces. Whether clients are seeking pain and muscle tension relief, support for stress and anxiety or general relaxation, the therapist will tailor the treatment to their unique needs during either a 30-minute or 60-minute session. In this article, we've invited five of the Spa's therapists to introduce their healing modality and tell us about themselves. Helene is an experienced bodyworker who offers a synergy of eastern and western massage practices. She offers a personalised, intuitive treatment that may include Swedish massage techniques, acupressure, gentle Thai yoga stretching and Reiki. Helene says that as a result of our busy, stressful lifestyles, many people are in a state of high alert, with muscles and soft tissues taut and armoured in ‘fight or flight’ response. With the right quality of touch, she says the therapist can tap into the client's parasympathetic nervous system, the system of ‘rest and digest’. "Just like a drop of water touching the surface of a still lake, the moment the therapist lays his or her hands on the skin, a resonant, electrical field force of energy effects the client, to slow down the heart beat and respiration. "Our skin is the interface between our body and the world. The sensitivity of our skin is so great that it can pick up and transmit an extraordinary range of signals, due to the abundance of nerve endings in its thick middle layer or dermis. Not only that but our skin and nervous system originate from the same ectoderm – the primary outer layer of cell tissue in the embryo from which all our body systems develop, which means that they are directly related. Depending on how you look at it, the skin is the outer surface of the brain, where every touch will initiate a variety of mental responses. "Touch and massage (along with other activities such as meditation, breathwork and mindful exercise) can not only initiate changes in the patterning of our nervous system but induce deep relaxation and stillness. With touch, bodywork and movement can come the softening of the body to bring about repatterning in our cellular system; initiating change, aliveness and subsequently new expression in our lives". Helen is also an experienced somatic movement teacher, weaving dance, yoga, shamanism, art and dreamwork together to help clients release tension and blockages, unleash their creative potential and become fully present in every moment. She offers regular classes, workshops, retreats and one to one sessions. 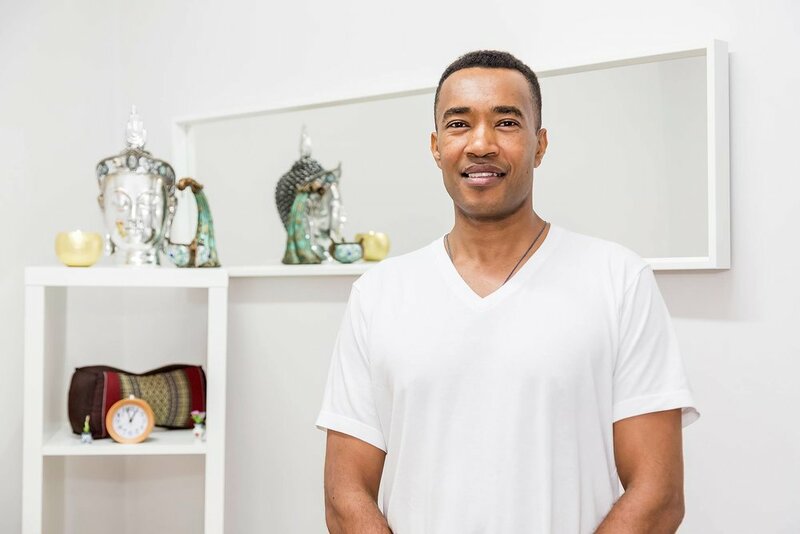 Daniel is skilled and experienced in a range of modalities, including deep tissue massage, No Hands Massage, Craniosacral Therapy, Thai Massage and Clinical Aromatherapy. He is currently training with the North London School of Sports Massage to become a level 5 accredited sports massage therapist. Daniel also holds a degrree in Occupational Therapy and worked for 10 years as an Occupational Therapist in the NHS. "Living and working in London, I've developed expertise over the years in dealing with a range of issues related to living in this great and fast-paced city. I regularly offer support to office workers who suffer from poor posture due to sitting at a desk for long hours, and people who suffer from muscle tension, back and neck pain, anxiety or low mood. "My journey to becoming a Complementary Therapist began with Craniosacral Therapy, which I pursued out of curiosity rather than as a career move. This initiated me into the fascinating realm of complementary therapies, which many therapists will tell you is a compelling field of study and practice. Gripping like a gold rush fever, the pull to discover and train in more modalities in order to support a client's healing journey, and develop yourself, is hard to resist. "Craniosacral therapy is practised fully clothed on a massage table or on a mat on the floor. It originates from osteopathy which means that we understand and view the body in a similar way. The difference is that craniosacral therapy does not involve manipulations and in its gentleness lies its strength: Craniosacral therapy has the potential to free your inherent body intelligence for self-healing. It's a very effective complementary therapy for addressing both physical and emotional issues. "Training as a No Hands Massage practitioner has taught me to look after myself physically, emotionally and in my relationship with clients, notwithstanding the incredible massage technique itself! No Hands Massage is a therapeutic treatment described as 'The Gentle Giant of Massage'; the technique involves no hands and instead uses the soft surfaces of the arms. Adding skills such as advanced deep tissue massage (with hands!) and chair massage has gently but firmly rooted my approach in the practice of massage as a tool for remedial and therapeutic aims". Led by a powerful curiosity, Sarah first tried Shiatsu in September 2016 and was blown away by the experience. She received another treatment two weeks later during which she experienced the same warm buzzing through her limbs and an expanded sense of awareness that "words cannot really express. For the first time ever perhaps, I understood what deep physical and mental relaxation felt like". Shortly after, she committed to study for a Diploma in Shiatsu says she could never have imagined the new direction that would unfold. Sarah typically works with people who have busy schedules, who feel they are “always on” and want to be able to relax, experience relief from aches and pains, and sleep better. Sarah's Shiatsu training incorporates holistic acupressure and she has also trained in Medical Qigong, as well as completing a foundation module with Well Mother (supporting fertility in women). "Shiatsu is a powerful form of energy-based bodywork, which can effectively treat a range of musculoskeletal and stress-related problems. It can support the maintenance of good overall health and also help to prevent many types of health issues from arising. With its roots in Japan and in Traditional Chinese Medicine (TCM), Shiatsu uses the practitioner's relaxed body weight, applied principally with the hands, to stimulate the body’s own self-healing. In addition to treating a wide range of specific health issues, it is deeply relaxing and can enhance your overall sense of wellbeing". Sarah will be offering chair-based Shiatsu sessions at the festival. Adele is an Ayurvedic Massage Practitioner and also advises clients on Ayurvedic Nutrition and Lifestyle. Adele's passion for Ayurveda stems from her own personal experience; she was first introduced to this traditional Hindu form of medicine by having an Ayurvedic massage. She then attended Ayurvedic consultations and followed a strict Ayurvedic diet and lifestyle for nine months. The positive results spoke for themselves. Adele is taught by an authentic, traditional teacher of Ayurveda; a qualified Ayurvedic doctor (BAMS) from Sri Lanka. She completed an Ayurvedic Head, Face and Body Massage Diploma in 2012 and added an Ayurvedic Nutrition and Lifestyle Diploma (ALND) to this in 2015. She has a passion for learning and utilises Ayurveda in all aspects of her own everyday life. "I'm inspired and committed to helping clients to attain optimal health, reach their wellbeing goals and help them learn new information and tools that they can use for the rest of their lives. "Ayurvedic massage is far more than just massage. A short consultation prior to the massage aims to find out how I can personalise the client's treatment for their specific needs. The Ayurvedic massage strokes vary from deep to superficial and follow the flow of energy channels, nerve pathways and hair growth. There are three types of movements – active (strong pressure), passive (delicate stroking) and persuasive (pinching or kneading the small muscles with the thumb and forefinger). "Before the Ayurvedic massage, the therapist focuses their energy with a brief balancing meditation and during the treatment will synchronise their breathing with the recipient in order to maintain a deep connection. Ayurvedic massage is performed with an acute awareness of the marmas and chakras. Marmas are vital points similar to acupressure points and if manipulated correctly, they revitalise the entire body. Though there are many marma points, 107 major spots are located at the junctions where flesh, veins, arteries, tendons, bones and joints meet. It is at these points that pain and weaknesses tend to accumulate. "After the treatment, the client is provided with Ayurvedic health tips that offer useful information to support optimal balance and longevity. Ayurvedic massage can be undertaken for the sheer pleasure of receiving a deeply relaxing, indulgent body massage, or can form part of a more comprehensive Ayurveda programme. "As part of an extensive Ayurvedic consultation process and programme, an initial stage looks at the causative factors of any health problem(s). The client is then asked to alter aspects of their diet and lifestyle according to the nature of the imbalance. The second stage assesses the best detoxification and rejuvenation therapies, through the use of Ayurvedic remedies, to remove toxins (ama pachana) and to increase the digestive fire (agni deepana). This will allow the person to regain their natural balance, improving both digestion and elimination; aiding the natural detoxification process in the body. Finally, treating the main health issues with appropriate Ayurvedic herbal remedies can help to diminish, or even completely eradicate the illness or health problem". Mario is an accredited Shiatsu therapist in Namikoshi & Seiki Meridian Shiatsu methods. As a racing athlete at a young age, he learned how powerfully his body could perform under physical pressure and despite exhaustion. Since then he has been fascinated by the incredible ability of the human body to overcome obstacles through physical endurance, resistance to fatigue through the power of the mind, and in recovering from physical injuries. "I believe there is truth in the saying that if the mind is weakened the body consequently suffers. In order to treat the body effectively, one has to treat the mind and vice versa, but a connecting link is necessary so that one can help the other. That connection is rooted in our inner healing power; in our ability to activate communication and communion between the mind, body and spirit. "As a therapist, I see my role as facilitating health, wellbeing and balance through the modality of Shiatsu; however the true power to heal always rests with the client. My mission is to make wellness services accessible for all those in the need of a special and effective alternative medicine treatment. "Seiki Meridian Shiatsu is a healing method that works with the internal seiki (life force) of the body, allowing it to naturally deepen and expand. This positively charged life force is the foundation of the human energy field and all body functions and life processes. It flows through the body in channels called meridians. These can be sensed and worked with therapeutically through the patterns of pressure points called tsubo. "The Shiatsu Seiki therapist connects to the feeling of their internal seiki while simultaneously connecting with it in the patient. Eliminating any form of judgment and observing the patient with complete acceptance lets the internal Seiki respond and guide the depth and duration of physical pressure. This is applied using the thumbs and fingers, the hands, forearms and knees depending on the area of the body being treated. "The charging of the meridians with seiki stimulates the body’s internal healing power. This initiates the process of deep mind and body healing. With improved circulation in the meridians, Jaki, the negative energy that has accumulated in the body, dissolves and releases pain, stiffness, tension and stress, along with their associated symptoms. "Seiki Shiatsu is based on the two complementary principles: the Yin – empathy and intention from the heart of the therapist and the Yang – the application of accurately angled and continuous pressure. By synchronizing the application of pressure with the heart’s intention, Seiki Shiatsu reignites and strengthens the patient’s internal healing power". What Are The Ten Keys To Wellbeing?